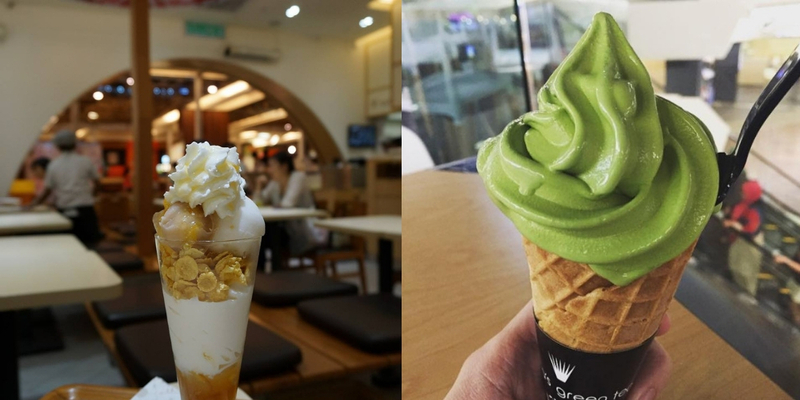 It’s honestly no shocker when several eateries exited the Malaysian F&B scene this year. It happens even to the best and most popular of food chains, so what more those that have clearly outlived their stay. There were the almost goodbyes like Tealive, and then there’s the actual goodbyes. Molten cheese tart brand Pablo was one of the brands that took the swinging of the axe but unsurprisingly Malaysians barely batted an eyelid—the same way Nana’s Green Tea’s departure in The Gardens on the last day of July was only a temporary shock. Much like tearing a bandaid off. In fact, perhaps the only F&B brand this year to have made such a lasting impact on Malaysians was the possible departure of Tealive. Now that’s branding done right on Bryan Loo’s part. To make your fans that invested in your brand is something that money can’t buy. And to think that Malaysians could mourn the possible death of a boba tea brand! Sadly, that’s not something that Nana’s Green Tea has, or perhaps ever will have. A quick call to Pavilion’s front desk assured us that the sole Nana’s Green Tea in Malaysia is still alive and well. 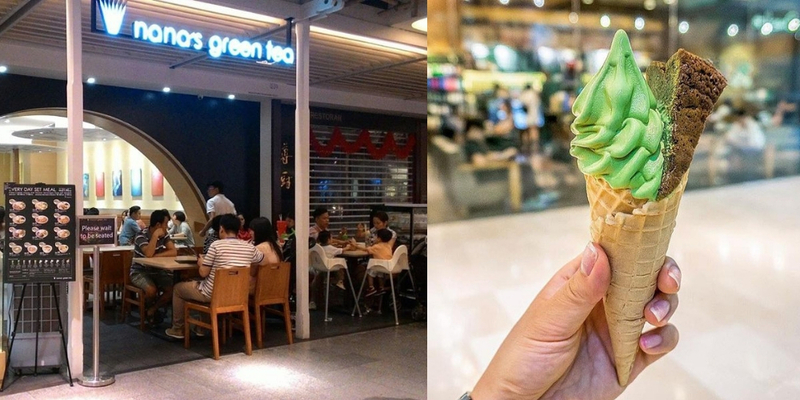 Though we’re unsure if the clock is ticking for the green tea restaurant, I’d say the quicker their exit, the better because the longer their stay, the more the damage done. And it’s no mere exaggeration that there’s just way too much of a mess right now for the brand to clean up. 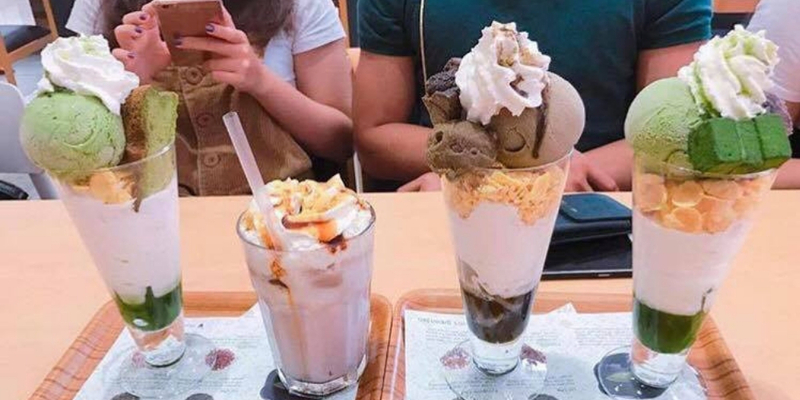 Take the sh*tty customer service for one. With more 1 star ratings than you would bother to even count, it’s hard to believe that the comments are somewhat biased to the negative end. 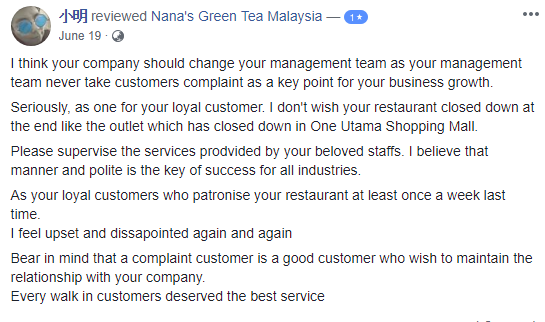 There’s definitely something inherently wrong with their lineup of staff, both in the existing Nana’s Green Tea outlet and of the one that has already closed up shop. It’s a classic case of “anger a bunch of customers and you would definitely face the ugly aftermath”. While there’s no telling for sure why we waved goodbye to the outlet in The Gardens in the first place, it’s a blessing in disguise that they left. But of course, as Masterchef Canada’s Alvin puts it, “food is king”. That was after all how the Canadian-based Hongkee was able to overlook sloppy presentations and rude culinary contestants on the cooking-based reality show. But even at the core of it, Nana’s Green Tea was unable to salvage that little bit of dignity. Gum paste-like veggie rice, bones found in one’s meal, food that is served cold, spilled soup over the food tray. There’s simply no excuse for constant hiccups after constant hiccups. And that’s why even down to its dying breath, Nana’s Green Tea still received its fair share of bad reviews. 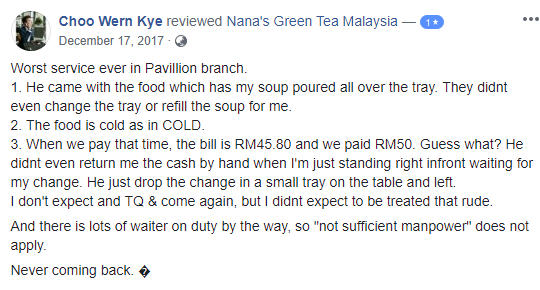 From poor customer service to meals that were served and prepared without heart, I’d say that it’s best that the green tea brand closes up shop for good in Malaysia. And that’s why I’ll be awaiting Nana’s Green Tea Pavilion’s ultimate demise. I’ll even toast to that…with green tea.